Bishop Michael B. Curry served as rector at St. Simon of Cyrene in nearby Lincoln Heights, Ohio during the 80’s while also serving as Bethany’s chaplain. He still serves as an advisor to the Community of the Transfiguration. 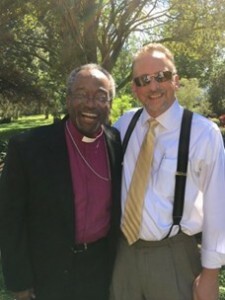 While on campus Bishop Curry was videotaped for some upcoming promotional videos for the campaign and learned about the progress of the ‘quiet phase’ of the campaign that is now underway. Full details of the Bishop’s comments about Bethany will be seen with future video releases, but he did share with us that Bethany is a unique ‘gem’ for the Episcopal church noting that no other school has as much diversity. “This is such an easy sell,” said Curry. “Bethany not only offers outstanding academics but it does so within a diverse ethnic, socio-economic, and even religious environment. I have no doubt that Bethany will reach its goals with this ambitious campaign,” Curry added. “It’ll happen,” said Bishop Michael D. Curry. Bethany School is being served by Ward, Dreshman and Reinhardt and campaign director Steve Siegel. With offices in Falls Church, Virginia; Chicago, Illinois; Los Angeles, California; and Toronto, Ontario, WD&R is the first and oldest full-time, on-site fundraising consulting firm in North America. For additional information, please contact the firm at www.wdrincorp.com or (888) 830-0533.